Impress all your friends and family at dinner with this lovely origami napkin swan! All you need is a simple white napkin–paper napkins work very well for this model. You can also make this napkin swan with a cloth napkin that's been pressed in half and in half again. Pressing (ironing) the napkin while folding is recommended. It is worth practicing on inexpensive paper napkins to start with. Make a bunch of these for a wedding or bridal shower! Start with your napkin nice and flat – you can make it even crisper by ironing it, even if it's paper – just be careful! Start by making sure the open points of the napkin are at the top right. Fold the napkin diagonally in half, bringing the bottom right corner up to the top left corner and crease well. Next unfold the napkin back to the start. Fold the top left and bottom right corners to either side of the crease you just made, leaving a gap. The lower left corner should be a sharp point. Fold the top left and lower right diagonal edges in again to the same place and crease well. Rotate the napkin and bring the bottom point up to the very top but do not press this crease. Fold the napkin in half, bringing the left side backwards to the right. The thinner point should be at the front, wrapped around the larger back section. Pull the longer point up to form the neck of the swan. Once you have decided on the position, crease the base of the neck well. Don't bring the neck too far forward or the swan will topple over! Open out the neck and focus on the back of the neck where the head is going to be formed. Fold the top point down a little. Taking the top of the point, flip it back over, creating a Z-shaped crease. The "beak" can be as long or short as you like. You can experiment with the head and beak. Re-fold the body of the swan and create the head bend by creating diagonal folds as shown in the bottom left photo. Spend some time squashing and folding the beak and neck until you are happy with the shape. If you are finding this a little tricky, it may be because your napkin is too thick, if it's a 2-ply napkin you can peel off a layer and use them separately for the swan. Failing this, you can simply fold the the head over into a simpler head shape. In order to secure the "tail" of the swan so that it won't fall over, find the very last layer underneath the tail. Pull on the flap and flip it over, creating a diagonal crease on the inside of the swan. Flip the swan to the other side and fold the tail over and then tuck it inside. You can fold it over one more time inside to completely secure it. Finally, we can start peeling the layers of the tail backwards, you can use all of the layers or just a couple. Peel them towards the head and then pull them up and out towards the back of the tail, being careful not to rip the paper. 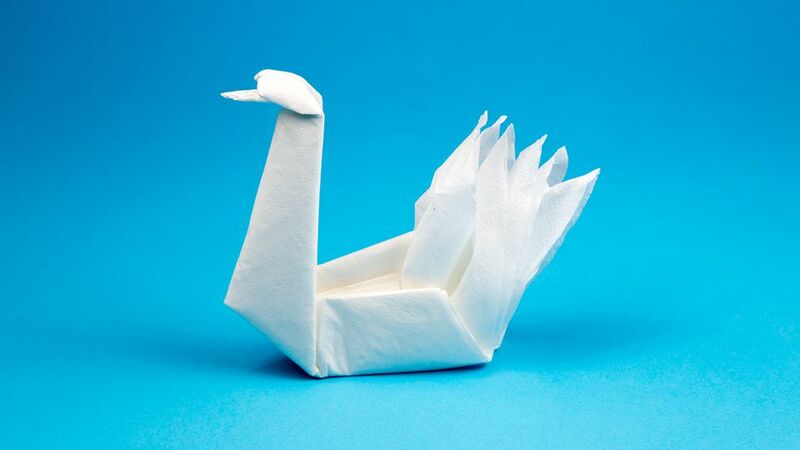 Now that you have completed your first origami napkin swan, it's time to make another one! The first time you fold an origami model, it's unlikely to look the best, but on the second try, it's bound to look great!